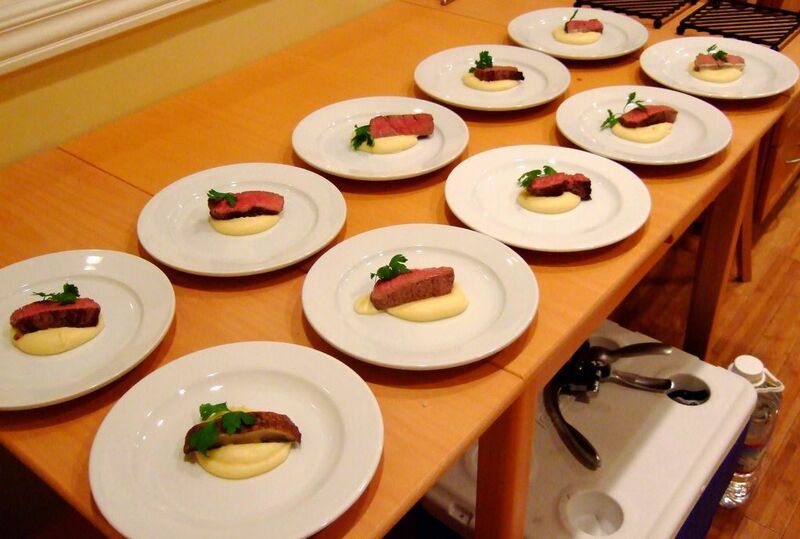 The fourth course for this year's White Truffle Dinner was Prather Ranch Beef Filet with Truffled Parsnip Puree. The evolution of Course 4 over time has undoubtedly been more linear than that of any other course. Whereas my selections for Course 3, for example, have meandered about almost aimlessly from one year to the next, every dish that has occupied the fourth spot on the menu has directly built upon its counterpart from the year before. The course was initially little more than a vehicle for featuring an item that I just knew had to have a place on the menu: Truffled Creamed Leeks. Sauteed in olive oil before being cooked down with chicken broth and cream, this dish became an instant favorite from my very first bite. I was unable to find a creative way to feature the leeks all by themselves, so I took to searching for something to bask in the spotlight while the leeks ostensibly played a supporting role. A scallop one year, a shrimp the next. But the leeks always stole the show, just as I assumed they would. This year's selection, however, took a pronounced step away from my old favorite, while carrying on with the beef theme that I introduced last year. And as explained below, I have to admit that the menu -- and I -- were both made the better for it. As described in an earlier post, the decision to abandon the leeks was prompted by my desire to use a corn and leek soup as the opener. I generally avoid featuring the same item twice in the menu, so having both a leek soup and creamed leeks struck me as undesirable. I liked the results we achieved last year by using beef in Course 4, so I was heavily leaning toward retaining that ingredient. But with what could I pair it, if not the leeks? Potatoes were out of the question, as they tend to make the dish -- and hence the meal -- too heavy. Within moments of starting to ponder all of this, a word suddenly appeared in my mind, as though placed there by some external force: parsnips. I will never know how or why the idea of parsnips came to me. Prior to that date, I had no taste memory of the vegetable, I had never purchased or cooked with one, and I had no active recollection of being served one in a restaurant. Indeed, I'm embarrassed to say that I would have been lucky to be able to pick a parsnip out of a root vegetable lineup, having grown so accustomed to skirting quickly by the lonely end of the produce aisle where they all reside. Yet, here I was, impelled to investigate this unfamiliar ingredient for absolutely no discernible reason. I began consulting cookbooks and online resources, anxious to find recipes, serving suggestions, and even the basics such as the best method to cook a parsnip. 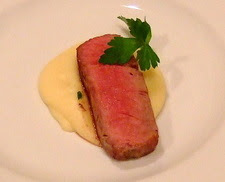 My desire for a texture that would complement the beef led me to settle on a puree, and I found several authoritative sources indicating that all I needed to do is boil the peeled parsnips in water and then run them through a food processor. Boil them in water? That's it? Shouldn't I at least consider using some chicken broth, or vegetable broth, to add a little flavor? As I walked through the grocery store getting the ingredients for my various cooking experiments, I picked up some extra broth just in case. After peeling and chopping a pound of parsnips, I realized that there was only one path toward rectifying my shameful lack of knowledge about the flavor of an unadulterated parsnip: to cook this first batch in water, not broth. As I slid the vegetable coins off my cutting board and into the boiling water, I grabbed one of the smaller pieces and popped it into my mouth. It tasted -- not surprisingly, I thought -- like a carrot. I gently boiled the parsnips for 25 minutes, checking periodically with a fork to see if they had become completely tender. When they had, I removed them from the heat, strained them, and reserved the water -- just as I'd been instructed. As the blades of my mini food processor whirred and the walls of the container fogged up from the steam, I was practically bursting with anticipation. Would they taste essentially like pureed carrots? Or would they be bland and lifeless, demanding the addition of broth the next time around? I slowly lifted the lid, and as the steam cleared and the edge of my spoon hit the surface of the puree, I was incredulous at what I saw. The parsnips had a silken consistency, like that of the creamiest, most buttery, and whipped mashed potatoes that I had ever seen. As my mind tried to grasp how this was possible from a mixture containing nothing but parsnips and water, I lifted the spoon to my mouth. The taste was incredible. The cooking process had softened the jagged edges of the flavor a bit, giving it a smoother, rounder taste that no longer resembled anything like a carrot. It was as though the transformation that had taken place on the physical side -- from hard, crunchy root to soft, fork-tender vegetable -- had occured in the flavor dimension as well. The consistency of the puree was a bit stiff at this point, so I added some of the reserved water -- one tablespoon at a time -- until it had reached the proper state. I seasoned with kosher salt and white truffle oil, and I found myself absolutely thrilled with the result. So much so, in fact, that I immediately called Rhonda on the phone and lamented that I had just wasted 38 years on the planet without partaking in the wonders of the parsnip. Who would have guessed that it would take the creamed leeks stepping out of the way to finally show me the light? Reading The Omnivore's Dilemma during a vacation last summer forever changed the way I look at, and purchase, beef. The horrific acts in which the industrial food system engages to produce the perversity known as "corn-fed beef" are disgusting, and you could not pay me enough to serve such meat to my guests. Fortunately, there are purveyors out there that are trying to do the right thing. Prather Ranch -- located in Northern California -- is one such outfit, taking great care to raise its grass-fed cattle using organic feed, mountain spring water, and ecologically sound practices. In fact, read the full account of the lengths to which Prather goes to ensure a quality product and see if you're not impressed. Prather has also satisfied the strict standards to be Certified Humane, a distinction not currently held by Northern California's other popular meat producers, Niman Ranch and Marin Sun Farms. And because I had purchased filets from Prather for a dinner party that I held last year, I knew firsthand about the quality of their service and their products. All in all, I could think of no better beef purveyor to support -- and to feature on my menu -- than Prather Ranch. And what a great decision it turned out to be, as the filets that we cooked for our truffle dinner were so meltingly tender as to be virtually indistinguishable from the American "Kobe" beef that I served last year. Strictly speaking, the beef dish -- with its heavier and bolder flavors -- should be served as the final savory course, immediately before the palate cleanser and dessert. But I decided to buck convention and keep it in Course 4 for a couple of reasons. First, it's my view that the menu should build to a crescendo in Course 6, and I was not quite prepared to have my beef dish serve as the "star attraction" -- particularly in a dinner focused on white truffles. And second, the dish had organically evolved in the fourth spot on the menu, so I was somewhat predisposed to simply leaving it there. Perhaps I will change my mind in future years, but only time will tell. 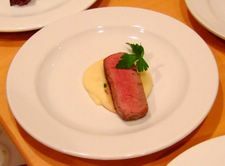 The night of our White Truffle Dinner, I placed three seasoned filets in a pan and seared the first side. After roughly four minutes, I flipped the steaks over and put the pan into a 450 degree oven to finish. 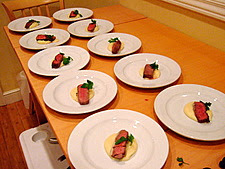 Rhonda and I put a small amount of parsnip puree in the center of each plate, followed by a single slice of the beef and a garnish of parsley. A few moments later, the dish was on its way to the table. I love these portions, just enough to taste and enjoy the flavors without filling up on just one of the dishes! Jennifer: Thanks for the kind words. Our dinner guests were as surprised as I was about the incredible texture that the parsnips attained all on their own, which is why I wanted to describe this in some detail above. I'm now encouraging everybody I know to try cooking with parsnips -- so please let me know the results if/when you do! Kat: Figuring out the right portion sizes was a major challenge in the early years of the dinner, as it's not something that we were accustomed to thinking about in the context of a tasting menu. It's one thing to estimate how much soup, or how much salad, or how large a crab cake should be provided when that one item will serve as the entire appetizer; it's quite another when it is merely one of the eight courses that will comprise the meal. After four of these dinners, I think that we've finally figured out how to portion the courses so that our guests are full, but not stuffed, by the end of the meal! P & B: To borrow an old phrase, if you have to ask the question, you probably don't want to know! But seriously, this course -- the beef filet and pureed parsnips -- is probably not bad at all; the portion of beef is very small, and there's just a little bit of truffle oil in the pureed parsnips. Looking at the dinner overall, there are certain items that rely heavily on cream, butter or cheese; again, however, the portions provided are always relatively small, so the total calorie count is not as high as if you were to sit down and eat an entire plate of the given item. Still, this meal is definitely meant to be an infrequent splurge -- not the basis for an everyday diet!